The following two-part series will delve into the evolution of China’s national security debates pertaining to maritime security. Part One will focus on changes and trends during Deng Xiaopeng’s administration and the immediate post-Cold War era. Part Two will analyze Chinese maritime policy debates going into the modern era. In his recent speech on China’s security policy on 17 February 2017, Xi Jinping, the General-Secretary of the Chinese Communist Party (CCP) and President of the People’s Republic of China (PRC) reiterates his Concept of Total Security (COTS, Zongti anquan guan) that he announced for the first time in April 2014.1 The COTS is a call for a kind of balanced approach to China’s post-Cold War security dilemmas that comes out of the country’s varied domestic and international security interests. On the top of Xi’s priority list is the balance between China’s continental and maritime interests, an ongoing intensive subject of debates involving a wide range of Chinese agencies from the military to civilian universities.2 At one end of the debates are rhetorical nationalistic outcries while at the other end are well-considered proposals. These polarized arguments came from fundamental socio-economic changes from when Deng Xiaoping started his market-oriented reforms at the end of the 1970s. They reflect a series of challenges that the Chinese government is facing. A review of these debates could help us identify not only the changes to Chinese national leaders’ priorities but also some of their underlying reasons. As Chinese research institutions are behind the changes, a review of the evolution of debates reveals some dynamics and developments within China’s research institutions. 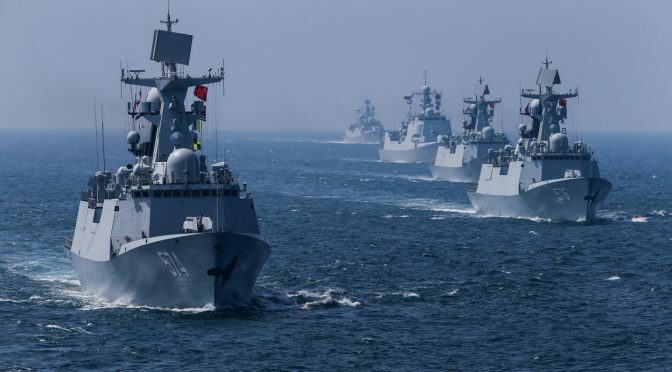 It would therefore help us understand China’s current security dilemma in maritime affairs and Chinese researchers’ intellectual restraints in finding solutions to the dilemma. As Deng’s reforms was the seed of this dilemma, it is necessary to review the impacts of Deng’s reform on China’s national security first. Deng’s reforms saved the People’s Republic of China (PRC) from the same fate of the Soviet Union through re-entering the international community and the world market. Thirty years after the start of the reforms, the People’s Republic has become the world’s second largest economy in 2010. In the meantime, however, Chinese leaders find that their country is falling into a security dilemma.3 On the one hand, China’s well-being is dependent on its overseas trade. This means that China has shared interests with the United States and other countries in the security of Sea Lines of Communication (SLOC). And it serves China’s interests for China to develop a blue-water navy in order to contribute more to the international naval campaign of SLOC protection. But on the other hand, some legacies of China’s imperial and revolutionary past are pushing the country toward confrontation against its maritime neighbors and the United States. Among these outstanding legacies are the issues of Taiwan4 and China’s territorial disputes with countries around the South China Sea.5 Many of these countries are dependent on the presence of the United States to negotiate with China. Because Japan’s SLOC go through the South China Sea and close to Taiwan, these issues concern Japan’s security. Japan reinforces its ties with South China Sea countries with the tacit support of the United States. A formidable maritime coalition is therefore formed. To make the situation worse is the wild card of North Korea. Although China saved North Korea in 1950 and has been the latter’s quiet patron, Pyongyang does not trust Beijing, especially after China established diplomatic relations with South Korea in 1993.6 North Korea’s nuclear program not only poses a direct threat to China’s Northeast, but also led to the deployment of the American THAAD system that undermines the credibility of China’s missiles forces against Taiwan and the U.S. forces that might come to its rescue. Facing these unprecedented and complicated security issues, the Chinese government quietly lifted its ban on discussions on national security among the Chinese public. This lift resulted in a flood of publications. Many of them came from government-funded research projects.7 A few are from the Chinese diaspora. The Chinese public’s involvement in the discussion of China’s national security added a group of new players in the process of policymaking and implementation. Until this quiet lift of the ban in the mid-1990s, the discussions were restricted within the military and the relevant government agencies. Because the Chinese government altered research institutions after the Cold War, a brief review of China’s institutional evolution and historiography on maritime and naval affairs would help understand the reasons of this change and this change’s relations with current debates. In 1982, Deng replaced Ye of poor health with General Liu Huaqing, a veteran of the CCP’s revolutionary wars and a graduate of a Soviet naval academy. Liu, who was later dubbed as “China’s Gorshkov,”13 continued Ye’s unfinished task of exploring a proper strategy for the PLAN. As early as 1969, Liu served as a PLAN’s deputy chief of staff responsible for shipbuilding affairs. He had recognized that foreign trade was increasingly important to the Chinese economy and China would need a blue-water navy, even aircraft carriers, to protect its SLOC.14 In order to have necessary intellectual support, Liu, with Deng’s approval, established the PLAN’s Institute of Naval Affairs (INA) in 1985. The INA served Liu’s drive for a naval strategy and aircraft carriers. In 1987, Liu and the PLAN submitted a formal proposal for a PLAN strategy to the Central Military Commission (CMC), the commanding agency of China’s armed forces.15 But Deng did not approve the proposal and suspended the discussion on China’s naval strategy. However, in the meantime, he promoted Liu into the CMC and asked him to take charge of the PLA’s equipment affairs. By the time of Liu’s promotion, the Cold War was coming to an end, and the CMC began considering transforming toward the post-Cold War era. But the following discussions were strictly restricted to a few PLA senior officers. In 1991, three years after Liu’s promotion, the First Gulf War broke out and ended with an overwhelming Western victory that surprised the CMC. The First Gulf War demonstrated to the Chinese leaders and public that the Soviet and Maoist military doctrines were outdated, and the United States enjoyed comprehensive military superiority over China. The PLA would be in a disadvantageous situation if Taiwan’s efforts for de jure independence led to war. By that time, Chinese leaders had hardly taken into account the prospect of Taiwan’s de jure independence because the Chinese Nationalists were ruling the island. In the meantime, China and the West had a common enemy of the Soviet Union. As Taiwan was in rapid democratization and the Soviet Union no longer existed, the prospect of Taiwan’s independence became imminent. In response to the challenges across the Taiwan Strait, Deng, in 1992, ordered General Zhang Zheng, then 78 years old, to develop a new military strategy.16 The outcome of Zhang’s efforts was the Military Strategic Guideline of the New Era (MSGNE). The PLA’s focus of attention then began shifting from continental defense to a potential war across the Taiwan Strait. Zhang was open-minded. He acknowledged frankly to the PLA’s entire officer corps in many speeches that the West had left the PLA behind not only in equipment but also in military theories and doctrines. In order to promote research, he ordered the PLA to open its doors to graduates from civilian universities, a practice that was suspended after the Tiananmen Incident in 1989. Zhang’s new policy also encouraged the PLA’s young researchers to work on maritime and naval issues. One of them was Pi Mingyong, the current director of a research department of the AMS. He proved that the Chinese imperial and Republican governments had done their best to protect China’s maritime interests.17 The concept of seapower then began entering into the PLA’s thinking about future conflicts.18 In 1997, a collection of Mahan’s articles and book chapters were translated and published in Beijing.19 These were the first translated publications of Mahan’s works in China. While General Zhang encouraged the PLA to develop its intellectual power to meet the post-Gulf War challenges, the Gulf War also provoked Chinese public’s interest in military affairs. Commercial markets for military publications expanded tremendously. Publishers approached AMS researchers for manuscripts. At that time, PLA researchers including those in AMS were underpaid. AMS leaders had been tacitly permitting, even encouraging their researchers to work for extra income.20 The coincidence of General Zhang’s new policy and the market drive therefore altered the dynamics of research inside and outside of the PLA. Part Two will analyze Chinese maritime policy debates going into the modern era. Dr. Sherman Xiaogang Lai is an adjunct assistant professor at the Department of Political Science, Royal Military College of Canada (RMC). Before he immigrated to Canada in 2000, he served as a frontline foot soldier in China’s war against Vietnam, UN military observer and researcher in history and military strategy in the Chinese People’s Liberation Army during 1987-1997. The views expressed in this article are his own. 1. “Xi Jinping called and chaired a seminar on national security affairs,” (习近平主持召开国家安全工作座谈会), Xinhua, 17 February 2017 (http://news.xinhuanet.com/politics/2017-02/17/c_1120486809.htm ); Xi Jinping (习近平：坚持总体国家安全观 走中国特色国家安全道路), 15 April 2014, Xinhua, (http://news.xinhuanet.com/politics/2014-04/15/c_1110253910.htm); Liu Jianfei, “The Concept of Total Security,”(总体国家安全观：理论指导和根本方法), Xuexi shibao, 3 May 2016, (http://theory.people.com.cn/n1/2016/0503/c376186-28319452.html). 2. See: Sherman Xiaogang Lai, “China’s Post-Cold War Challenges and the Birth of its Current Military Strategy,” Journal of Military and Strategic Studies 16.4 (2016):183-209; Zhang Li and Ren Linlan (张丽任灵兰), “A Review of the Study of Maritime History in China in the Last Five Years” (“近五年来中国的海洋史研究”), World History (世界历史) 1 (2011): 118–27; Xu Qiyu, “A Study of the Dilemmas of Big Powers during their Rises,” PhD dissertation, Graduate School of Chinese Academy of Social Science, 2007, p. 112. 98 Wu Zhengyu (吴征宇), “Combined Powers of Seapower and Landpower” (“海权与陆海复合型强国”), World Economics and Politics (世界经济与政治) 2 (2012): pp. 49–50; Ke Chunqiao (柯春桥), “Historical Lessons of Big Powers’ Responses to ‘Syndromes of Rising,’(大国应对“崛起综合征”经验教训), Cankaoxiaoxi, 25 August 2016, (http://www.cankaoxiaoxi.com/world/20160825/1281068.shtml). 5. Eric Hyer, The Pragmatic Dragon: China’s Grand Strategy and Boundary Settlement (Vancouver, BC: University of British Columbia Press, 2015), pp. 237-262. 9. The author served in this unit during 1987-1997. 10. Ge’ershikefu (戈尔什科夫), Navies in War and Peace (战争与和平时期的海军) (Beijing: Sanlian chudian, 1974); See also: Robert G.Weinland, Robert W. Herrick, Michael MccGwire and James M.McConnell, “Admiral Gorshkov’s ‘Navies in War and Peace,” Survival, Volume 17, No.2 (1975): 54-63. 12. Wu Dian Qing (吴殿卿), “Ye Fei” (“叶飞”), in Leading Generals of the Chinese People’s Liberation Army (中国人民解放军高级将领传), Vol. 7 (Beijing: Jiefangjun chubanshe, 2007). See also Sherman Xiaogang Lai, “Ensured Loyalty versus Professionalism at Sea: A Historical Review of the PLA Navy (1949–1982)” (paper presented at the annual meeting of Chinese Military History Society 2016, Ottawa, Ontario, Canada, 14 April 2016). 14. Liu Huaqing’s Memoir (刘华清回忆录) (Beijing: Jiefangjun Chubanshe, 2004), 349. 15. Liu Huaqing’s Memoir, 431 and 439. 16. Lai, “China’s Post-Cold War Challenges and the Birth of its Current Military Strategy,” p.199. 17. Pi Mingyong (皮明勇), “Seapower Concepts and Theories of Naval Development in late-Qing China,” (海权论与清末海军建设理论), Studies of Modern History (近代史研究), No.3 (1994): 37-47; Pi Mingyong, “A Review of Theoretical Exploration to China’s Naval Strategies and Tactics in the early Republican China,” (民国初年中国海军战略战术理论述论), Military History (军事历史研究), No.5 (1994):101-108. 19. Alfred T Mahan, Haiquan lun (海权论) (Naval Strategy: Compared and Contrasted with the Principles and Practice of Military Operations on Land (Beijing: Zhongguo yanshi chubanshe, 1997). Previous PostSea Control 140 – The U.S. Coast Guard with Admiral Charles MichelNext PostWhy Does the United States of America Need a Strong Navy? Contact for Sherman Xiaogang Lai please. Thank you for asking my contacts. My email address at Queen’s is laix@queensu.ca.